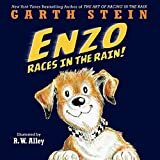 On the eve of a faithful canine's death, Enzo takes stock of his life while recalling the sacrifices, unexpected losses, and person struggles of his would-be race-car driver human, Denny, in the latter's efforts to retain custody of his daughter. 300,000 first printing. Reprint. I really didn't enjoy this book at all. I found the main character (the dog) to be singularly unlikeable. He hates his own species - derides it as unevolved and "less" - and seems to hate most humans as well. He's like a man with a disability who despises himself for having a disability, and longs not to have it...but hates anyone who doesn't have it on principle. This runs counter to everything I love about my dog(s): their ability to accept the present as it is, their willingness to consider that everyone might be worthy of their love, their lack of concern about the past or the future, their complete lack of shame or self-consciousness. There are lots and lots of detailed descriptions about race car driving which are probably great if you're into that sort of thing. I'm not. But they did provide an opportunity to quickly scroll through whole chapters. Don't really understand the hype, but like the title says, perhaps I'm just not the target audience. This book is quite good fun especially if you think your dog is human! An interesting promise- the world from the point of view of the family pet. Winds around the fallout of family disaster. The idea of a dog narrating seemed rather odd. However, this novel had me hooked from the first page! A love story, a family crisis and the tail (pardon the pun) of a dog and his family all rolled into one. A thoroughly enjoyable read - I highly recommend it! This has been an always will be my favorite book. I was hooked from the start and couldnt put it down. 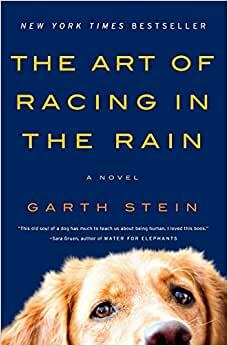 the story is good and well-written, although i feel that there could be a bit more about the dog and less about racing. Surprised how much I enjoyed this heartwarming and at times emotional story. This is not a dog book but a family story with an unusual insight.